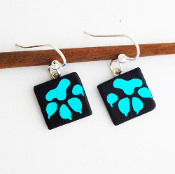 Blue Gingko Giusti Dichroic Glass Earringss with Silver Loops. 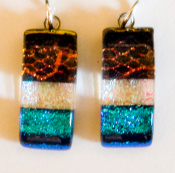 These earrings come in three other dichroic glass colors, yellow, green and pink. 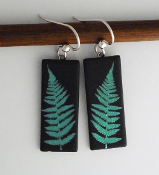 Blue Giusti Dichroic Glass Fern Earrings with Silver Loops. 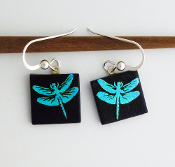 These Earrings come in three other dichroic colors, Green, Yellow and Pink. 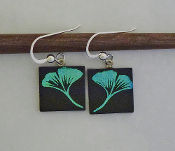 Blue Giusti Dichroic Glass Lilly Earrings with Silver Loops. 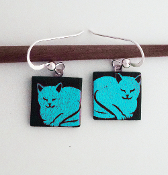 These earrings come in three other colors, Yellow, Pink or Green. 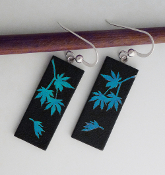 Blue Japanese Maple Leaf Dichroic glass Earrings with Silver Loops. 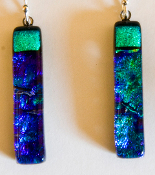 These earrings come in three other dichroic colors, Green, Yellow or Pink.